Crews salted the roads in advance of the coming storm. The first few, picturesque flakes may start drifting down from the gray sky Saturday afternoon, but that night things will start to get ugly, as a winter storm featuring snow, sleet, and freezing rain sweeps into Southern New England. The National Weather Service has issued a winter storm warning for the northern part of Massachusetts, warning of 8 to 16 inches of snow, with the highest amounts near the New Hampshire border. A winter storm watch has been issued for the lower tier of the state, including parts of Plymouth and Bristol counties. 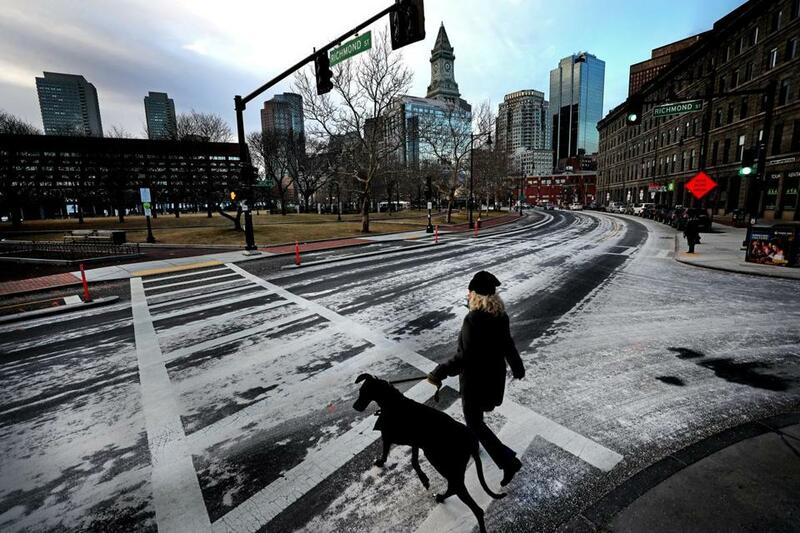 Forecasters expected the storm to blanket Boston with 7 inches of snow, with Lawrence, Fitchburg, and Greenfield seeing more than a foot, according to the service. Foxborough and Taunton could see a half-foot of snow, and areas on the South Coast, the Cape, and the Islands were expected to get between less than an inch and 4 inches. “A significant winter storm is in the cards for the region Saturday evening into Sunday afternoon,” the weather service said in an Internet posting. A snowfall total forecast map showed totals generally decreasing to the south and east, with Cape Cod receiving only a few inches of snow and the islands of Martha’s Vineyard and Nantucket getting only an inch or less. While significant snow will fall, much of the region will see a warmup between midnight and 6 a.m. and a changeover to sleet, freezing rain, or rain. In some areas, there may be power outages due to ice accretion. In the Providence-to-Boston corridor, the snow will likely change to plain rain, forecasters said. The rain could cause its own problems, the forecasters said, because the temperature is expected to drop below freezing again sometime between 8 a.m. and 2 p.m., which could turn roads and sidewalks into skating rinks. “Temperatures above freezing should quickly plunge well down into the 20s with even some teens possible. . . . The greatest concern is a flash freeze as rain will have washed off earlier road treatments,” the forecasters said. According to the Massachusetts Emergency Management Agency, some coastal flooding is also expected and wind gusts may reach as high as 50 miles per hour at times. The weather service said residents need to be prepared for moderate coastal flooding along the eastern coast of the state. Widespread flooding of vulnerable shore roads, basements, or both at the height of the storm is expected. “Lives may be at risk for people who put themselves in harm’s way,” the forecasters said. Minor coastal flooding is expected in other areas along the coast. Governor Charlie Baker on Friday told reporters that people need to pay attention to the storm warnings. Keolis Commuter Services, the operator of the MBTA’s commuter rail system, said in a statement it will dispatch 350 workers to respond to conditions that interrupt train service during the storm and its aftermath. Keolis urged travelers to build in some additional time for travel on the system during the storm and to use caution in the stations. Amtrak, the nation’s passenger rail company, will operate a “modified service” on Saturday and Sunday because of weather conditions. Changes include cancellation of the four Lake Shore Limited trains between Chicago, New York, and Boston, and reductions in the number of Acela runs between Boston, New York, and Washington on Sunday. More details are available at Amtrak’s website. Public safety officials are also urging the public to clear away snow from furnace exhaust pipes to prevent accumulation of carbon monoxide inside a home. National Grid and Eversource officials say they are putting on extra crews to deal with any power outages from the storm. Danny McDonald of Globe staff contributed to this report. Abbi Matheson can be reached at abbi.matheson@globe.com. Follow her on Twitter @AbbiMatheson. John R. Ellement can be reached at ellement@globe.com. Follow him on Twitter @JREbosglobe.